Welcome to January in Montana! b) finishing your holiday shopping at a nice, warm retail store. lucky to fit in an occasional afternoon feeding when the sun shines and the water inches up closer to 40 degrees. That should give anglers some realistic expectations about the number of strikes they'll have when water temps plummet. 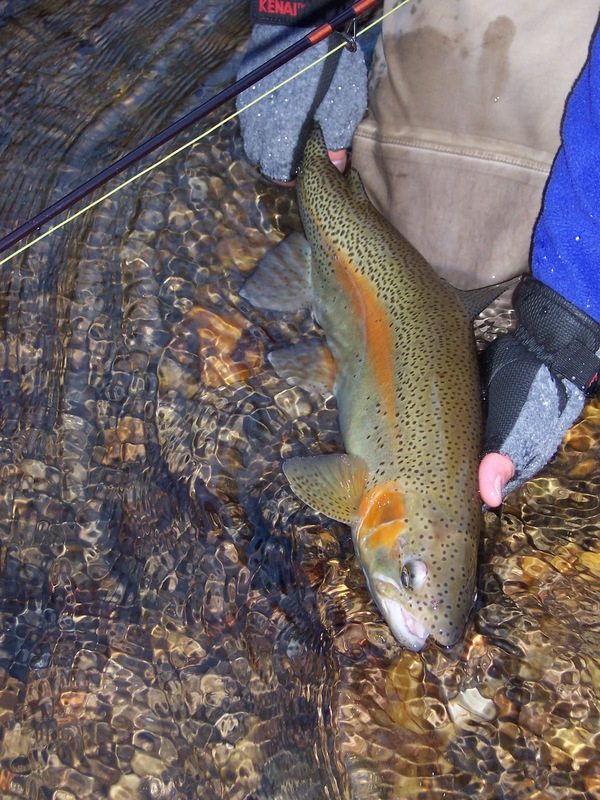 Some anglers call it "zen fishing" in the winter, as the strikes from stream trout are so subtle, they are barely perceptible. We use small flies dead-drifted on the bottom, and cast repeatedly into good-looking, slow spots in an attempt to bump the fish in the nose. They simply won't move far for food right now. We set the hook whenever we "think" something should happen and do not wait until we see an obvious strike! blasts. Lakes are still warmer than streams, too. Those who time their trips correctly to take advantage of increased water temperatures should have some luck. The good news is that the next extended run of warmer weather should turn on a lot of fish, so be ready to fish the tail-end of a 3-4 day warm spell.